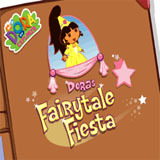 Dora has been invited to a party at the king's castle and for this party she has dressed herself as a princess. She looks so cute and she's excited to go to the party but just when she got closer the mean witch appeared and made a spell. The castle has been taken by a large cloud all the way to the moon. Dora is now trying to get there and in her way she will meet the Seven Dwarfs, the Three Pigs house and Jake's beanstalk.